Below is some information from across the district and across the state that I hope you’ll find of interest. 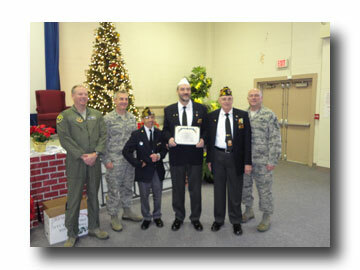 The John Rivers Memorial VFW Post 11322 in Quakertown, PA donated items to the 111th Attack Wing PA Air National Guard for military families in need prior to Christmas holiday. Shown left to right: Prior Vice Commander Col James Blaydon, 111TH Wing Commander Col Howard Eissler, Post Service Officer Vince Acquaviva Jr, Post Commander Paul Gerhart Jr, Post Chief of Staff Ed Brous, and 111th Command Chief CMSgt Paul Frisco. 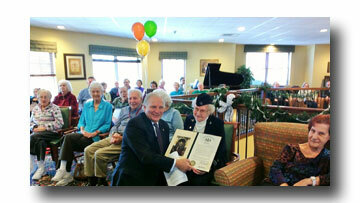 Senator Mensch appreciates all that our veteran organizations do for our veterans, their families, and the community. Please join me Wednesday, April 8 for coffee and discussion of state topics. Bring a friend and any questions you may have. The gathering will take place from 8 a.m. to 9:30 a.m. at the Skippack Township Municipal Building located at 4089 Heckler Road in Skippack. The event is free. For more information and to RSVP, please call our Pennsburg office at 215-541-2388. To view the event flyer, click here. 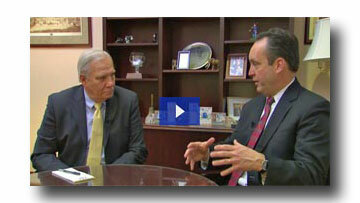 This edition of The Mensch Report features my discussion with Senate Majority Leader Jake Corman. Senator Corman and I focused on the Senate’s legislative priorities, which include pension reform. I invite you to watch our discussion as we identify our goals for the 2015-2016 session calendar. It is that time of year again! 2015 Adult Trout Stocking Schedules are now available. Anglers can easily search the trout stocking schedules for locations and dates of interest. The search results will provide each body of water within a county that is scheduled for stocking, the section of water, the date, the species of trout, the meeting place and time, the hatchery stocking the section, the regulations that apply and the latitude/longitude number. The PFBC annually stocks approximately 3.2 million adult trout in more than 700 streams and 120 lakes open to public angling. These figures include approximately 2.01 million rainbow trout, 641,000 brown trout, and 525,000 brook trout. As with past practice, the average size of the trout produced for stocking is 11 inches in length. When Dr. Wendie Berg found out she had cancer, she wasn't that surprised. She knew she had dense breast tissue and a family history of breast cancer. Now, she says she is even more motivated to inform every woman in Pennsylvania of the risks associated with having dense breast tissue. Watch her story here. The PA Breast Density Notification Act, which I sponsored, requires all women who receive mammograms to be notified of their tissue density. Dense tissue complicates early detection of breast cancer. Women who have extremely dense tissue are at a 4 to 6x greater risk of developing breast cancer. If you have questions, contact the PA Breast Cancer Coalition. Also, to help ensure women are getting the information they need, the PBCC offers a five-minute survey to women who have had a mammogram this year. You can take the survey here. Application forms for the Department of Revenue’s Property Tax/Rent Rebate Program are now available for eligible residents to begin claiming rebates on property taxes or rent paid in 2014. Applications are also available online or by calling 1-888-222-9190. Forms are available online. Members of my staff are available to help you complete the form. If you need assistance or have any questions, call 215-541-2388. 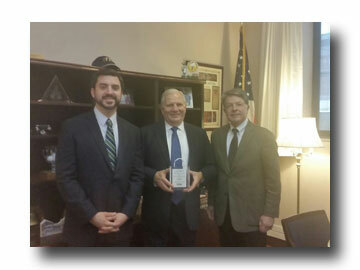 The Pennsylvania Food Merchants Association for presented Senator Mensch with the “Friend of the Food Industry” Award. As suspected identity theft and fraudulent personal income tax claims in other states gain attention, the Pennsylvania Department of Revenue is working to ensure personal income tax refunds are paid to their rightful owners. It will delay the payment of direct deposit refunds temporarily, while the potential impact of the situation in Pennsylvania is assessed. Additional refund evaluation criteria are being built into the department’s identity validation program based on elements common among cases confirmed as fraud in other states. To facilitate diagnosis of fraud techniques currently in use, the department is participating in an information share among U.S. taxing agencies and Intuit, the company whose product has been used to transmit the recent fraudulent refund claims. Report the incident to the Pennsylvania Department of Revenue at 717-787-8201. Report the incident to the Federal Trade Commission at www.consumer.gov/idtheft or by calling 1-877-438-4338. Report the incident to the Pennsylvania Attorney General’s Bureau of Consumer Protection by calling 1-800-441-2555. File an Identity Theft Affidavit (Form 14039) with the Internal Revenue Service. Close any accounts that have been affected. If a taxpayer suspects a notice or call concerning tax records is a scam, he or she may call the Pennsylvania Department of Revenue (717-787-8201) or IRS (1-800-829-1040) to validate the contact. 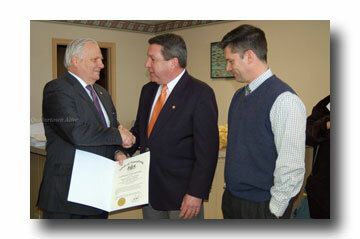 The TriCounty Chamber of Commerce recently joined Senator Mensch for a Legislative Coffee. 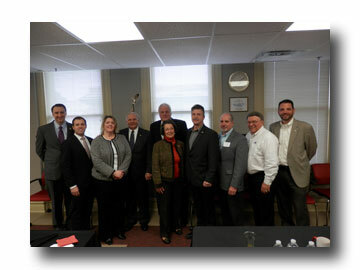 (L to R): Congressman Ryan Costello, Representative Ryan Mackenzie, Tri County Area CC ED Eileen Dautrich, Representative Tim Hennessey, Commissioner Valerie Arkoosh, Representative David Maloney, Limerick Township Manager Daniel Kerr, Glenn Ebersole and Alex Rahn. Individuals claiming to represent the “water company” or another utility will approach the resident and use a variety of excuses to enter the home. For example, they are supposedly investigating a “dirty water” complaint by a neighbor or checking water pressure due to a main break nearby. Once inside the home, the imposters typically divert the resident’s attention by sending him/her to the basement or kitchen to run a faucet while they or an accomplice robs another area of the home. Don’t be afraid to ask for photo ID, and take the time to examine the ID badge whenever someone from a utility company arrives at your home. If you are still unsure and have any suspicions about the individual’s identity, call 9-1-1 immediately. Also, contact your utility provider to ensure that the visit is legitimate before allowing them into your home. You can review Montgomery County’s 2015 Community Recycling events by clicking here. Events include household hazardous waste events, paper shredding events, and tire collection events. Your thoughts are important to me, and I encourage you to complete my Jan.- March survey here if you haven’t already. Please be assured your survey submission will be reviewed and your opinions noted. If you have additional questions or concerns, please do not hesitate to contact me.